I’m having surgery tomorrow to fix up my knee after tearing my ACL playing basketball a few weeks ago. The surgery is a very standard one and relatively quick. That said, I have of course been researching like crazy to make sure I’m as ready as I can be for it. I thought it might be helpful for me to lay out some of the preparation tips I’ve learned in a post although hopefully you never have to use them! I spent a lot of time researching (and doing) things over the last three weeks that will hopefully make my post-operation a bit easier. Here’s a few tips that I would recommend. Some of these tips apply pretty specifically to joint or bone surgeries. Put Meat on the Bone – At first, I thought that I should take it easy until my surgery, but I quickly learned that the opposite is true. It’s a good idea to exercise as much as you physically can without injuring yourself more before the surgery. The goal is to build or maintain as much muscle as possible since you won’t be able to use those muscles much after the surgery. A stronger body will make for an easier recovery after surgery. For me, this meant hours and hours on the stationery bike which is the only real exercise I can do. Get Used to Physical Therapy – Ask your doctor what exercises you can do before therapy. These might be the same as you will be doing after surgery. They might also be very easy. Do them every day anyway. They won’t be easy after the surgery and it’s a good idea to get your body used to the motions. Don’t skip physical therapy for anything. Personally, I know that it hurts a bit, but I feel better immediately after it’s done. Ask Around – Unless you are having a complex or rare surgery, it’s almost guaranteed that you know someone who knows someone who has had the same surgery. At a minimum, you can always ask Dr. Google. Find someone who has had the same surgery and pick their brain for tips. Clean the House – Before you go in for surgery, clean your house and make sure you have clean clothes ready. You’ll be too tired to clean for a while after surgery and you won’t want to be sitting in filth for days. Have a Meal Plan – Maybe you’ll order take-out every day. Maybe someone will be nice enough to cook for you. No matter what, make sure you have some sort of meal plan in place. For me, I’ve been making and freezing a lot of different meals that should feed me and Betsy for at least a week. I made four great frozen meals and I’ll be posting all of them next week actually! The day before surgery is pretty straightforward. Your doctor will tell you everything you need to know. It seems like the important things are to make sure that you don’t eat and drink for 12 hours before the surgery and that you have someone to pick you up from the surgery! It’s also a good idea to make sure you have any equipment you’ll need right after surgery. For me, this is crutches, leg braces, and lots of ice! As long as you’ve done everything up to this point, there isn’t much to do on the day of surgery. For me, my main goal is to not cause a self-induced panic attack! I thought a lot about what to eat the day before surgery. It seems like, in general, a low fiber diet is recommended on the day before surgery. A lot of the diets I researched were not actually nutritionally complete diets. In other words, they are diets that are specifically intended to only be eaten for a day or so to make surgery easier. Keep Dairy Limited – Don’t eat a lot of dairy before surgery. This includes cheese, milk, and yogurts. A cup or two is fine, but don’t go crazy. The Right Proteins – Proteins are good and needed for your body to heal, but don’t eat any proteins that will be tough to digest. Stay away from tough cuts of meat or legumes. Go with soy protein, egg whites, or lean cuts of meat. Avoid Whole Wheats – This is pretty much the only time that I’ve read to choose white breads over wheat breads, but wheat breads have way more fiber and will take longer to digest. Avoid Raw Fruits and Veggies – Again, they just are harder to digest. Go with cooked veggies (steamed things are good) and fruit juices. If you’ve had surgery or helped someone with a surgery, I’d love for you to share any tips you might have in the comments section. Hi Nick — Bonne chance! This advice is specifically from someone – me – who had a total knee replacement 3 months ago. If you have any throw rugs, put them away! Way too easy to trip over. And you’re absolutely right about the PT. Do it, no excuses. 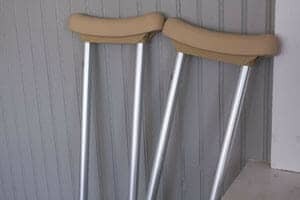 And a silly thing I didn’t know: the crutch goes on the side opposite the injured leg, not the same side. Good luck Nick! Matt and Laura said it was horrible so I wish you a speedy recovery. And hope your nurse takes good care of you. Jean’s right, get rid of your throw rugs and anything loose on the floor (including extension cords etc.). And think about who drives you home – it will be difficult to get into a car with the knee brace & crutches, if you know someone with a truck or SUV it will be easier to get in & out of the vehicle. Don’t be a hero, take your pain meds. I had knee surgery 2 years ago and it wasn’t fun but not horrible either… The best thing I had was a cryotherapy unit which circulates ice water around the knee & helps tremendously with swelling & pain. Thanks Judy. We just bought a new SUV a few months ago. Good timing I guess! After having 12 knee surgeries and finally a total knee transplant, my best words of advice are to follow the doc’s orders and don’t skip pain pills! I have a high pain tolerance but low tolerance to pain meds (they knock me out) I found I was doing mare harm than good by postponing the pain meds. Also for the first day or two it’s best to find a comfy spot that you can put your leg up comfortably, have books, and so forth at easy access so you won’t be asking all the time. I just made me a “nest” that was easy to get up and down from, had room for me to do some of my exercises and a nice end table to hold my books and so forth. I also had a portable table t (wood type that folds up) to put my lap top on. Best of luck with your surgery, may the surgeon’s hands be guided and the staff be blessed in your care. Thanks for the tips Marianne. Hopefully I don’t need 12 of these suckers! My mother had a knee replacement at age 75 and did just excellent. She was peppy, did all her therapy, and had no problems or complaints. I have a feeling you will do just fine. Main thing in any surgery is having good support system. Looks like you have that down with a great wife! Wishing you the best and a very rapid recovery. If you don’t have one (or a few) already, get an extra charger or two for your laptop. I know it can be a little pricey and is kind of a weird thing, but if you have one in each of the two rooms where you’re spending the most recuperation time, you won’t have to trek across the house or up and down stairs when your battery runs low. If you’re more of a smartphone or iPad person, do that instead. On the food front, LENTILS! Packed with protein. Almost 18g per cup. I humbly recommend this recipe http://kitchenettedc.com/?p=350, but you can also stash a nice lentil salad with a vinaigrette in the ‘fridge, French style, to much on whenever and it won’t even require standing around while it reheats. Sending happy healing thoughts your way! Best of luck Nick, will be thinking of you tomorrow! NICK, this is FABULOUS information which people really need to heed!!! I worked many years for a PT/Rehab facility, and almost NONE of our patients had prepared in this way. As a result, their rehab was difficult, and many did not even complete it. It’s YOUR body, and it’s NOT someone else’s job to “make you better”. It is YOUR job. What a great post! Happy recovery; I know you’ll do very very well!!!! Just to be EXTRA careful-use a marking pen to identify the knee needing surgery-try to be humorous so surgical staff is not insulted-“healing starts here”-You’re a wordsmith- you can come up with something even better! Good luck, Nick. My friend (another basketball casualty) had it recently, and his experience was much better than mine ten years ago. Surgery for me was easy; physical therapy was challenging. And when it was all over, did I ever feel bad about not going out of my way to help people on crutches. This is advice for the bystanders: Help! Open the door, carry the package. As for you: 1) Never skip anything the physical therapist says to do. 2) 98% recovery is not good enough. You can get there. 3) Your desk chair is a great makeshift wheelchair. Trying to get a glass of water from one end of the house to the other? Desk chair. My friend’s playing basketball again, by the way. Good luck Nick! It sounds like you’re well-prepared. Hopefully knowing that you have tons of “internet friends” pulling for you will help with the recovery as well! Good luck. As an RN I have a small bit of advice. Listen to your body. You will be given advice about exercise, etc. When you have pain, rest a bit and then work again. Doing too much too fast can slow down your recovery. Make haste slowly. And by the way…. thanks for a great blog! Wishing the best and speediest of recoveries! Pain management tip- to reduce the need for the stronger stuff which many people find a bit disorienting, you can supplement (or hopefully replace fairly quickly) with an alternating course of tylenol and ibuprofen each the full dosage but every two hours. and so on, so that you are only taking tylenol every 4 and ibuprofen every 4 as directed. By alternating you keep the relief even. You can’t do either one sooner than the recommended four hours, but the combo can be like a miracle. I learned this from my son’s orthopedic surgeon, while I was nursing my son through multiple knee surgeries. This is great advice, and I’m speaking from personal experience with my own surgeries and with taking care of family after surgery. Be very careful doing this, most prescription pain medications have tylenol and a few have ibuprofen already in them… The abbreviation for tylenol is APAP so if your med is hydrocodone/APAP 10/325 that means it has 10mg hydrocodone AND 325 mg tylenol already in it, keep that in mind when dosing with additional Tylenol…. If you’re unsure ask your pharmacist or doctor. Just wanted to let all his readers know that Nick is out of surgery and doing just fine (thanks to the pain meds)! I highly recommend a cryocuff ice device that keeps iced water circulating around the surgical site. I’ve had 2 shoulder surgeries and it makes all the difference. If you MD won’t order one, you can buy them online. I’ve loaned my out to 3 other friends post-surgery who all now swear by it, too. I know you are out of surgery and well into recovery. I recently broke my ankle and sprained both ankles and feet (I fell off the top step of the tractor- clutz I know). It wasn’t a fun experience but I did learn some things. I was on crutches for a very long time. When you use crutches you can’t carry anything. I ended up using 1 of my kids backpacks. I put laundry, things that go in another room, etc in it. It became something I really depend on. I also learned you need to think ahead to what your needs are. When you are in a room, do everything you can think of in there so you don’t have to “run” back again. As a nurse I will suggest a few things: elevation, ice, physical therapy and stay on top of your pain. Uncontrolled pain is so much harder to get back under control. You also have to be very careful of the amount of Tylenol you use. It is in many pain meds (listed as APAP or acetaminophen). Overdosing of Tylenol can cause liver damage. Sounds like you have everything under control! Good luck!! This is some really good information about general surgery. It is good to know that you should try to exercise before a surgery. I didn’t realize that it will actually help you recover faster. That does seem like a good thing talk to a doctor about.